Located in the densely packed Ironbound neighborhood of Newark, Lafayette Street School and surrounding blocks previously had no outdoor recreational spaces where kids could safely play outside. The new schoolyard changes that. Now, the new space includes a turf field, a climbing structure and play area, room for basketball, soccer, and plenty of outdoor seating for the 1,100 students and more than 3,000 children living within a 10-minute walk. The playground also has color! – with beautiful murals designed and painted by Lafayette Street School alumna and artist Gera Lozano, inspired by the school mascot and student drawings. The community's interest in returning the schoolyard to a place of play began almost a decade ago. 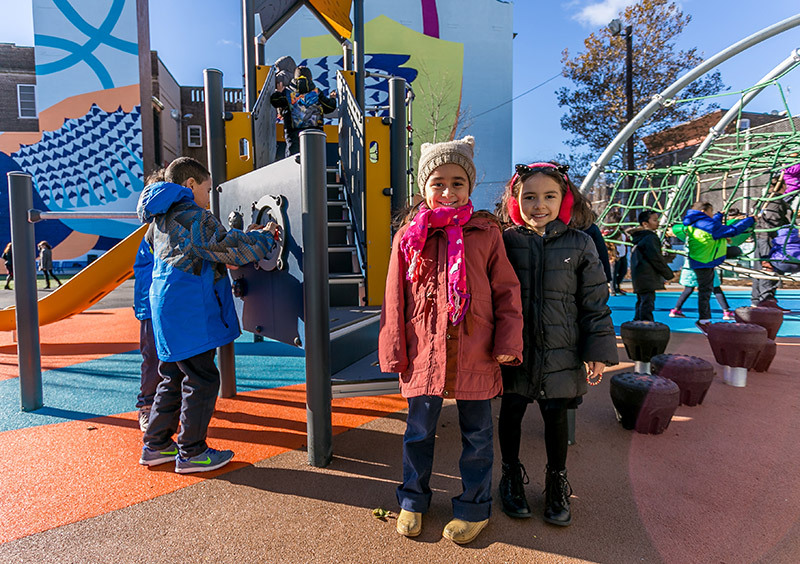 Lafayette Street School parents, Councilman Augusto Amador, members of the Ironbound community, The Trust for Public Land and Newark Public School district, worked together in a campaign to transform the asphalt lot into a vibrant public space for the students and surrounding community. Volunteers, school administrators, teachers, alumni, Ironbound businesses and local foundations all joined the cause to create the playground. Among the many donors to the campaign were the Edward and Sharon Cruz Family Foundation, PSEG Foundation, The Healthcare Foundation of New Jersey, Gibson Family Foundation, John and Margaret Post Foundation, Helen and William Mazer Foundation and Johanette Wallerstein Foundation. Thank you for your early grants to build momentum for the effort.